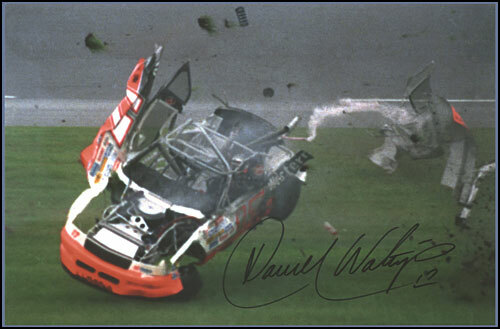 DW Signed 1991 Daytona Crash Photo 8" x 10"
While running in the Top 10 at the Firecracker 400 at Daytona in July 1991, D.W. was involved in a wreck on the backstretch that saw him barrel-roll 11x before coming to a stop. Incredibly D.W. was only bruised and raced the next week! Photo by Bill Blose. 8" x 10"